Minor correction of flag of the city of Yaita. The city emblem was adopted on Nov 1st 1958 and the flag was adopted on Nov 1st 1978 by Notice No 64. The green flag has a white city emblem in the center. The city emblem is stylized kanji 矢　Ya and hiragana い I of YaIta. It represents a growth of the city. The flag proportion is 2: 3. The height of the emblem is 3/5 of the height of the flag. The flag law does not show kanji name at the lower hoist in the official city flag. 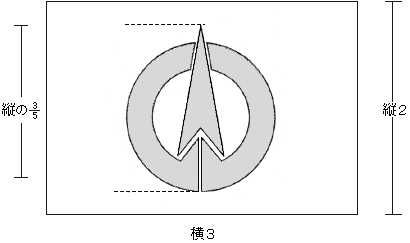 the emblem is hitagana I い in silver with a gold arrow and fringe.